Singh Movers Melbourne are the top-notch Removalists Deer Park who endows the residents of Melbourne, its suburbs and the nearby cities with the quality services of different types of removals. Large scale moves need heavy equipment and more no of team members along with proper planning, care and safety measures to be undertaken. Our Furniture Removalists Deer Park service includes the large and small scale shifting. The size of the vehicles totally depends on the size of your belongings whether it be 2 tonnes, 6 tonnes, or more than that. Singh Movers have a variety of the types of vehicles for the Furniture movers and they will provide you with the one which suits your material. We plan all the schedule and moves carefully to ensure our clients that everything will be done on time and Two Men And A Truck will reach to your desired location with all your goods prior the time is given by you. With Singh Movers, do you really need to worry about the safety of materials? Or do you really need to worry for the timely shifting? No, you do not as we are the company who works according to the client and not by their ease. So, feel free to contact us for the FURNITURE REMOVALISTS DEER PARK at any time round the clock as we will always be available to assist you with your queries. 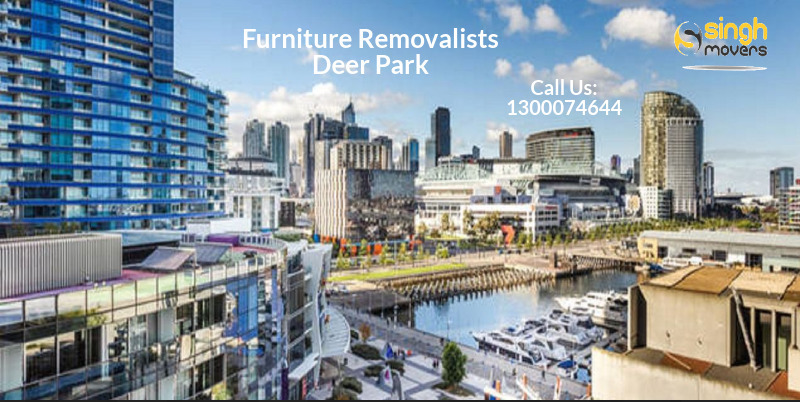 Singh Movers promise the quality Furniture Removalists Deer Park service at low-cost prices to our clients of deer park suburb of Melbourne. Our employees are fit and well-trained in the field of FURNITURE MOVE. We are known as the most Affordable Movers And Packers who make the stressful task into the relaxing one. Furniture is an essential part of the house that needs the utmost care. So, for the careful move and shifting, hire us and be free from all the worries. We are affordable and secure storage solutions that come your way. Ask our customer care executives if you have any doubts, have a talk with our experts, set your mind, and feel free to hire us for the fabulous services. However, there are many Office Movers available in this city of Melbourne who will promise you to provide you with the quality services but no one will actually provide you with all of the services like office relocation, furniture removal, storage facility etc. under one shed. Professional Tools: SINGH MOVERS is not a company who just provides shifting but not with proper safety measures. Singh Movers treat every customer as their family and get their work done with proper safety and using professional tools. Our professional tools include trolley, dollies, heavy duty blankets, a toolkit for assembling, and disassembling furniture, ropes, shrink wraps etc. The deer park is a suburb of Melbourne, Victoria, Australia which is around 17 km west of the Melbourne’s central business district. Its local government area is the City of Brimbank. Deer Park had a population of 18,126 according to the census of 2016. The original name of the suburb was Kororoit creek after the creek running through the suburb. The deer park is mainly serviced well by a railway station on the Melton greater- metropolitan line. Kororoit Creek is on the northern boundary of the suburb. On the southern outskirts of this deer park suburb, there are large farming properties. When it comes to relocating, we are the best choice for you in this city of Melbourne. As all of us know packing and moving is not an easy job and so many MOVERS and PACKERS are available but hiring the best and quality FURNITURE MOVERS is the toughest task. Hurry up clients and do not panic or do not think twice before hiring us.